While we think it’s best that cats remain indoors, there is something to be said about exposing your cat to the outside. Outdoor environments present a variety of stimuli such as sounds, smells, and sights that cats may find interesting and are missing in an indoor environment. One way to expose indoor cats to the outdoors is with Pet Magasin's Pet Travel Carrier. Difficult urban environments such as crossing a busy street with your cat become as easy as wearing a backpack! The Pet Magasin is exactly as it seems - essentially a pet carrier with backpack straps that enables the user to wear it as a backpack. We’ve been testing it with Quinn for a few weeks now and we’ve been very happy with it so far. The pack itself is very well designed. It’s sturdy yet provides just enough cushioning to soften the occasional (light) knocks and bumps. Wearing it is comfortable for users of several heights, and it also has abdominal straps to shift weight, thereby helping with ergonomics. In addition, the pack has zippable viewing “vents” on both sides so that your companion can see the outside. 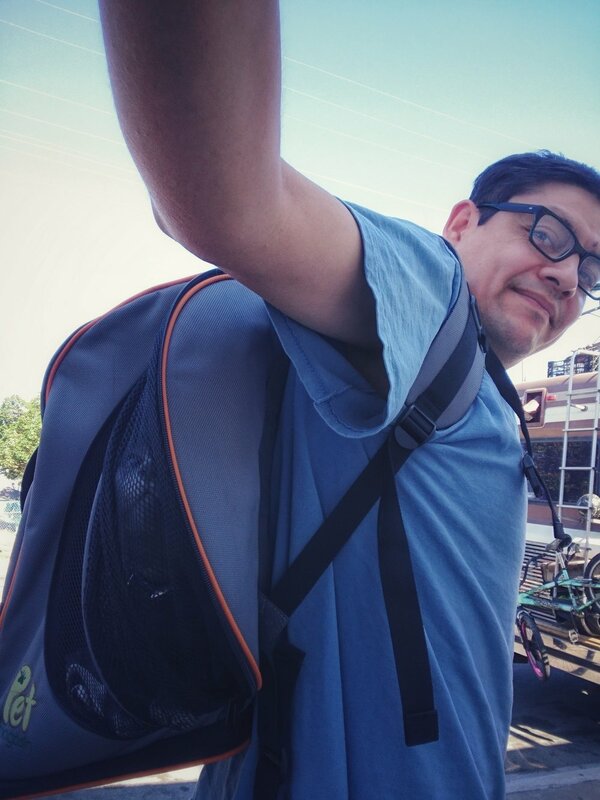 In testing the BACKPACK, we’ve taken it out for nearly twenty 10-30 minute walks the past few weeks. We’ve monitored Quinn to see how he does during the walks. At first he meowed his displeasure for few minutes (and when unintentionally provoked when we went to "baby him" when he’s in it), but left alone in the back, he eventually settled down. Now he very seldom meows in it. He also seems to have adjusted to the “bounce up and down” that’s caused from normal walking - he adjusts his head accordingly for a more steady view. Quinn is fixated on the photographer here. While Quinn can be a bit of a scratcher, the netting part of the pack has survived our trips completely intact. Our only unknown is that since he’s still only 5 pounds, we’re unsure how well he’ll fit in as he continues to grow. We also have limited the length of our walks on purpose; as of yet still haven't gone more than 30 minute outings at a time. Enables indoor cats to be exposed to the outdoors within a well-confined, protected environment. Makes transport of cats (and small dogs) easy and ergonomically friendly. Creates more opportunities and incentives for owner walking/exercising. We have really enjoyed the Peg Magasin Pet Travel Carrier and highly recommend it. To encourage success, we recommend the following tips below. Tip 1: Make it a routine. Cats and dogs love the predictability of routines. 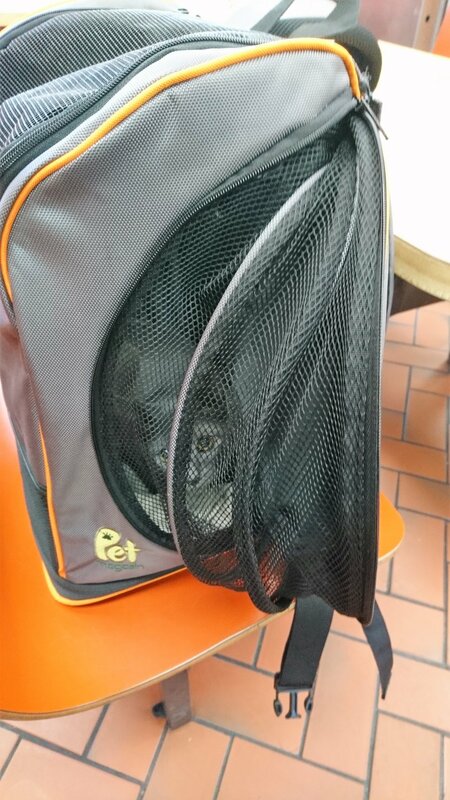 Turning the outings into routines reduces the chances that the trips develop into “freak out moments” that indoors cats sometimes exhibit when they go outside (like when they’re put into a carrier to go to the vet for example!). We always take Quinn out at the same time of the day. We also follow up the trips with his dinner immediately afterwards so that he receives positive reinforcement. Now, whenever we take out the pack, Quinn walks up to it. Tip 2: Don’t “baby” your cat if he/she meows a lot when they first go in it. This will only reinforce his/her angst. But don’t completely ignore him either - be mindful that he’s not over stressed by the whole event. Finally, start out slow, with only 5 minute walks, and slowly increase the times, always reinforced afterwards as noted above. The Pet Magasin Pet Travel Carrier is available for purchase on Amazon's website here. As the “dog days of summer” continue, not only do we have to worry about protecting our animal companions from the heat, we also have to contend with another all too familiar foe: fleas. In reality, even though flea infestations tend to peak in summer, our mild winters mean that we can have breakouts at any time of the year. This is an important fact - for Southern California, fleas can be a year-round problem, and even indoors-only friends are susceptible to infestations. For fleas, “infestations” is an appropriate term - for each flea we happen to see on our companions, there are likely many many more on them and in the environment at home, including our bedding, carpets, and couches. In fact, it is their apparent ubiquity that often makes many pet owners give up attempting flea control. For some of us, fleas on our dogs and cats seems like a normal, if unattractive part of having pets in our lives, much like cleaning a litter-box. But it doesn’t have to be this way. Especially in the past 5+ years, there have been many next-generation flea control products that have been proven to be safe and highly effective, especially when used in conjunction with other environmental products. The range of choices include topical spot-ons (like Bravecto), oral tablets (Comfortis), and chews (NexGard and Bravecto). Most of these products are considerably more expensive than the last generation of products, which sometimes discourages their use. We remain big advocates of them however. Especially when considering the costs associated with the ineffectiveness of previous products, these new products are not as expensive as they seem. Simply, the cost of a generic topical treatment, flea collar, flea shampoo, flea spray, and yard spray can quickly approach that of an often more effective next-gen product. In addition, the costs of treating conditions such as flea allergy dermatitis, hot spots, tapeworms and other various conditions (not to mention general misery for both the pet and the owner) is an additional cost/benefit analysis that is often forgotten when comparing the costs of various products both in-store and online. In short, there is no longer a need to rely on the old powders, flea collars, yard sprays, and flea bombs of yesterday. Today represents a golden age in development of flea control products that past generations of pet owners would’ve loved to have access to. They are safe, effective, and not as expensive as they seem when comparing them to the costs of not using them. Opportunities to price-shop across many pet stores, veterinarians, and reputable online sites also make bargain hunting easier. The result is that the perception of fleas as a “normal” condition on our pets isn’t being realistic; in many cases it's antiquated, and it’s often from not doing enough. For more information on these products, click below. So, you've decided on getting pet insurance but don't know where to start? Pet owners looking for insurance often face a bewildering array of coverage options. This downloadable chart (current as of August 2018 and courtesy of DVM360 magazine) is an excellent starting point for comparing some of the major policy companies. It also serves as an excellent "primer" on knowing what to ask and what to research for when choosing an insurance company. Download and print the chart here. For many pet owners, choosing a pet insurance between the many options available is a daunting task. Meet Quinn, the newest addition to our family! Quinn came to us a couple of months ago and, although his arrival was unexpected, he very quickly grew in our hearts. As we've gotten to know him we have found him to be intelligent, happy, inquisitive, and very energetic! Quinn's favorite hobbies are batting around paper napkins, balled up pieces of paper, and socks. (His biggest annoyances are extended restraint and shots.) While his favorite food is cooked chicken, we've discovered that he also enjoys a surprising variety of foods such as spinach. Quinn is named after a derivative of several similar "Q" words - a philosopher, a friend (or rather, his-ex), and an old tv show. Most of the time Quinn is playing and running around in the back office area of the clinic, though from time to time we do take him out to the front of the clinic. Having not had an animal companion share our lives for the past year, Quinn has reminded us of the multi-decade commitment of responsibility of time, costs, and care that come with acquiring a companion animal. (Yes, even for us, adopting a companion is a serious and challenging undertaking.) Because he grew up without his littermates, we have needed to take extra time socializing him and making sure he expends plenty of energy. Sometimes we think that he thinks of himself as just another human. The AVMA sponsors National Pet Dental Month every February to spotlight the importance of dental care to your pet's health and well-being. Bad breath, drooling, dropping food, or difficulty eating are all clues of more advanced dental problems that you may notice at home. Your veterinarian may detect other signs, e.g. gingivitis, chipped tooth, loose tooth, tooth resorption, and treat them before they lead to more serious problems. A comprehensive oral health assessment, cleaning and treatment (e.g. extractions) under general anesthesia may be recommended for your pet. After the cleaning, a good home dental care program is important to maintain that fresh breath and oral health. As with behavioral issues, preventing dental health problems is one of the more difficult subject for veterinarians and their teams to tackle because it relies on you, the caregivers, to do the work at home. Showing you how to brush your dog's teeth is also not something that can easily and effectively be done in a brief exam room visit. Below are a series of very short videos we did with Elaine almost 3 years ago on how to start brushing your dog's teeth. Click anywhere on the pictures to start/stop the videos. Beginner's Guide to Brushing Your Dog's Teeth: Step 1: Handling Her Mouth. Beginner's Guide to Brushing Your Dog's Teeth, Step 2: Touching Her Teeth. Restraining or holding your pet for the brushing depends on her size and willingness to sit still. Some pets do better sitting with their back to you; others like Elaine, do better facing you. The amount of time it takes for your pet to get used to having her teeth brushed depends on how much handling she already gets and how consistent you are with the routine. It is like developing any habit --- consistency, rewards, and patience. For complete beginners, pets who have not even had their mouths handled at home before, we usually suggest at least a week of daily practice for each step. Most people give up or fail because they rush and expect to be brushing their pet's teeth after a few days. Move on to the next step only when you can safely and repeatedly do each exercise. Yes, that means it may take a month before you actually brushes her teeth but by then, dental care would be part of her daily routine, not a feared procedure that you have to force on her. Sweet Elaine was not the most trainable dog. It's embarrassing but I think it took us almost 6 months before I was able to brush her teeth. I started then gave up when it seemed she would never learn to sit still for the brushing. We then did 10-15 seconds sessions and eventually worked our way up to actual brushing. I'm sure it will not take 6 months for you and your pet, but don't expect it to happen overnight either. If you are currently not brushing your pet's teeth daily, give it a try. It is a much overlooked practice that not only improve her health and prevent bad breath but, like daily walks, also strengthen the bond between you and her. Elaine is getting her daily teeth brushing.